Trainee Veterinary Nurse, avid yoga enthusiast, hockey player, and best friends with a beautiful red dog, 2 hardworking ex station horses,1/2 a horse (miniature), Billy the Cat, guinea pig, chickens, sheep and cattle. I grew up between the ocean and the land. My school years were spent in the beautiful bay of Busselton & every chance we got on weekends & school holidays on my Grandads farm in Pemberton living the dream with no end of land to run and play on and an abundance of animals from the pretty laying hens to prime Wagyu cattle. Farm days were spent with my younger sister, cousins and friends, as we would head off for the day on adventures that felt like we had travelled far and wide. Time was also spent helping in the sheep yards,moving stock, riding on the back of a motorbike, feeding out hay and befriending the farm cats so they would stay just that little bit longer before heading off to catch their next feed. My memories on the farm always involved spending time with, saving and caring for animals, and I thank my Grandad for this as he was an avid animal lover himself and would do his utmost to help them all. Leaving school behind saw me complete my trade qualification as a chef, surfing my mornings away and working through the afternoons into the night. During this time we had a pet guinea pig called Coco, she lived to be 12 years old. Far beyond the expected 5 years old ! 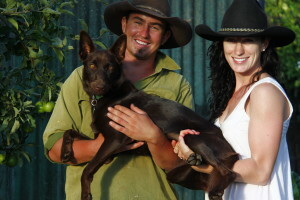 Then along came Minni who is a blue heeler X, which we purchased out of a box at the markets for a $10. Minni would often ride in my ute down for a surf and dig long trenches in the sand while she waited. She now enjoys her retirement curled up next to the fire with short strolls on the beach. After completing my apprenticeship it was time to spread my wings, so I booked a one way ticket to travel the east coast. The day before my flight I met Nick an adventurous type, lover of everything country & a mad keen fisherman. It was time for us to hit the road in a 75 series cruiser filled to the brim with a caravan in tow. During the two year trip around Australia we worked on a remote cattle station in the Northern Territory, 300km south of civilization, here I started out cooking for the cowboys, joining the musters when I could and raising the orphaned calves and piglets and nursing the sick calves and the injured horses back to health. 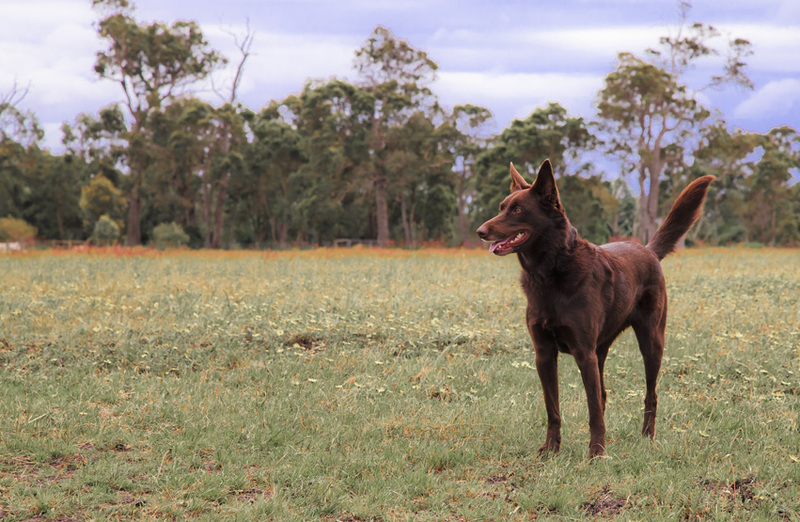 On our return home we found ourselves back on the family farm working…. then along came our red dog, Bear, a gentle soul who had energy to burn and kept us on our toes with her cheeky puppy ways. After raising her on the farm it was time to hit the road again with Bear by our side. 4000 km back to the station we went for another adventure! This time found me on the back of a stockhorse as a Jillaroo and in the meantime completing my Agricultural certificate. During this time along came Rose a retired stockhorse. I chose to nurse her back to health after she become severely unwell during her wet season spell. This meant being stabled for close monitoring, medicating, feeding and most importantly plenty of unconditional love which saw her back to strength after eight long months. As our last season on the station drew to an end we learnt the property and business would be sold. The boss proposed I took her home! This was not my intention in the beginning but giving her the chance to retire in comfort sounded like a great idea. Station life on a 3 million acre property meant up at daybreak and working into the dark mustering Brahman cattle on horseback, drafting, fighting bush fires on land strewn with the odd wild mickey bull, pigs, dingoes, donkeys and snakes. Amongst the good the bad and the red & dusty dirt, it’s an amazing experience we will never forget. Christmas that year saw us return home with not one horse but two! Nick chose a friend to bring home as well. Both Rose and Dually went from working in the red dirt to riding on white sandy beaches & swimming in the ocean. Living back in Busselton animals have always been a big part of my life, I returned to working this time round on a local dairy farm milking and raising calves. I decided to gain more skills and knowledge in a field I am most passionate about and am now training as a veterinary nurse here at Vasse vets. I’m extremely thankful to have a fantastic learning facility at my feet and to be part of a team who are dedicated to using their skills and knowledge to provide quality care for all animals. I look forward to meeting you and your precious pets very soon.